HCM CITY — The number of Vietnamese students in the US has increased consistently for 16 consecutive years, according to the Institute of International Education’s (IIE) annual Open Doors report. The report for the 2016-17 academic year shows that Việt Nam remains the sixth-leading country of origin for all international students in the US, with nearly 22,500 students, up about 1,000 students since the 2015-16 year, with a nearly 5 per cent increase. The data shows that nearly 1.1 million international students came to the US in the 2016-17 year, a 3.4 per cent increase over last year. International students now make up 5.3 per cent of all higher education students in the US, up slightly from 5.2 per cent last year. 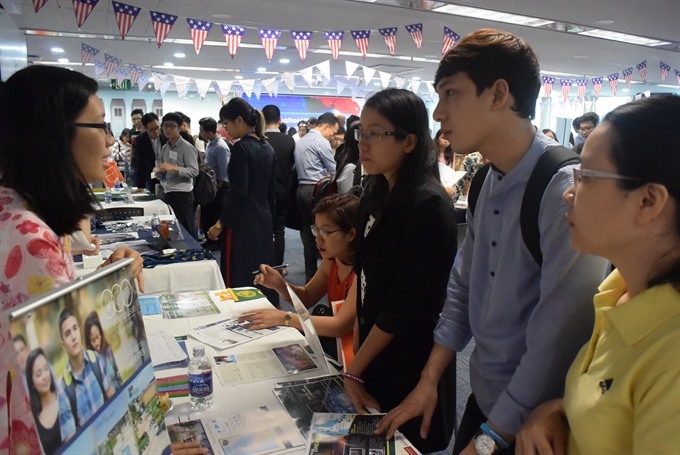 Of the Vietnamese students in the US during the period surveyed, 68 per cent were undergraduates, 15.6 per cent were graduate level students, 9 per cent were enrolled in optional practical training, and the remaining 7.4 per cent were pursuing non-degree programmes. Engineering, business and management, and math and computer science remain the top selected fields of study by international students in the 2016-17 year. Math and computer science were the fastest-growing fields of study with an increase of 18 per cent from the 2015-16 year. The top 10 states for international students include California, New York, Texas, Massachusetts, Illinois, Pennsylvania, Florida, Ohio, Michigan and Indiana.